Often referred to as the ‘Henley of the North’, Durham Regatta is one of the premier events in the northern racing calendar. Racing takes place over 700 metres with the elite men’s and women’s fours events being competed over 1800 metres. This 1800 metre course requires that crews negotiate the historic Elvet Bridge at full race pace. The regatta, founded in 1834, is run by a combination of local rowing clubs and townsfolk. 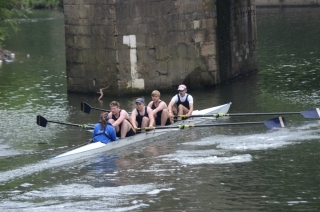 Durham Amateur Rowing Club being a founding member of the regatta continues to take a very active role in the organisation and running of the regatta. In addition to racing, the regatta regularly hosts demonstrations of other sports including Dragon Boating and parachuting. There are also a number of side attractions and a popular classic car display.